Jan. 3, London: Protest G4S Complicity in Torture - Free the Hares Boys! Jan. 3, London: Protest G4S Complicity in Torture – Free the Hares Boys! Solidarity with 5 Palestinian children tortured and caged by Israel for a crime that never happened. Over the next few days over 50 masked Israeli soldiers with attack dogs stormed the local village of Hares in the early hours of the morning and in waves of violent arrests kidnapped the children of the village. In total 19 children were taken to the infamous G4S secured children’s dungeon at Al Jalame and locked up in solitary confinement for up to 2 weeks in filthy windowless 1m by 2m cells with no mattress. The children were violently tortured and sexual threats were made against the female members of their families in order to coerce confessions from the boys. With the confessions and the new “eye-witness” statements, five of the Hares boys were charged with 25 counts of attempted murder each, even though there were only four people in the car. Apparently the military court had decided that 25 stones were thrown, each with an “intent to kill”. The five boys – the “Hares Boys” – Ali Shamlawi, Mohammed Kleib, Mohammed Mehdi Suleiman, Tamer Souf, and Ammar Souf are currently locked up in another G4S secured facility – Megiddo prison where G4S provides the entire central command room. With no evidence of a crime the military court keeps on postponing the hearing dates for the children. All the October, November and December military court dates so far have been postponed and new ones issued for January by the Israeli military to the families of the boys, meanwhile the boys remain caged now for nearly 10 months now. Family visits are routinely cancelled with no notice being given, Ali Shamlawi mothers last scheduled visit on 17th Dec was cancelled – its a way to exert psychological pressure on both the children and their families. Not that evidence, or lack of it, has any bearing in an Israeli military court – a study conducted by the Israeli NGO ‘No Legal Frontiers’ over a 12 month period concluded that 100% of Palestinian children brought before the military court are convicted. If the five boys are convicted they will be locked up for over 25 years – five young lives ruined with no evidence of a crime let alone their guilt. 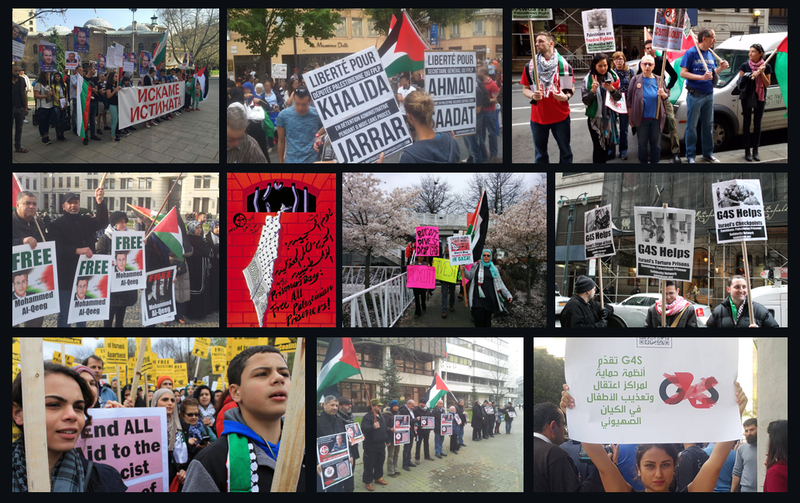 We are demanding the immediate and unconditional release of all the children and hold G4S complicit in Israel’s crimes, particularly in the torture of Palestinian children. We will also be protesting in solidarity with the three hunger strikers Mohammad Badr, Islam Badr, and Thaer Abdu who have been on hunger strike since 16th November to protest their ‘administrative detention’ – the practice used by Israel to imprison Palestinians indefinitely without charge or trial. Under administrative detention prisoners are given rolling detention orders which can be anything from 1-6 months, renewable indefinitely. This is against international law. In the past administrative detainee Mazen Natsheh has been locked up cumulatively for nearly 10 years without charge or trial. Detention orders can be based on so called “secret information” which never needs to be produced, either to the detainee nor their lawyer, but often administrative detention is used to arbitrarily jail Palestinians where there is no evidence for a trial, or as a form of punishment as in the case of 10 Palestinian MPs currently locked up without charge. Israel has on average issued over 2000 detention orders every year (2007-2011). Today there are 145 administrative detainees. Thaer Abdu was abducted by the Israeli occupation forces from his home on 27th October and is being held under a 6 month administrative detention. Mohammed and Islam Badr are brothers, and were abducted from their family shop on 28th October. Mohammad is being held under a 6 month detention order whilst Islam is on an initial 3 month detention. All three are held in G4S secured Ofer prison, but unlike other Palestinians who are placed in the political “security” section, they have been put in section 14 which is for common criminals. Until recently they were on total hunger strike, taking only water (no salts and no medication). As a result their health deteriorated very rapidly and they had to be transferred to hospital on 12th December. Now they are taking salt with water. Both Mohammad and Islam have lost 12kg in weight since the beginning of their strike. To punish them for their hunger strike the prison has put them in isolation and taken all their personal possessions from the cell and denied then adequate blankets and bedding whilst being kept in a very cold room making even drinking water difficult to swallow. Everyday the prison guards continue the punishment by violently raiding their rooms at least 5 times daily under pretext of inspection. Despite their hardships all three prisoners are committed to their hunger strike. The British security contractor G4S is complicit in Israel’s illegal practice of punitive administrative detention. Figures from April show that 86% of administrative detainees – the vast majority, are locked up in G4S secured Israeli prisons. Most of them having been transferred from the West Bank into Israel in contravention of Article 76 of the Fourth Geneva Convention. We will, inshAllah, be tweeting live (hash tags #FreeHaresBoys #G4S ) from the protest with live photos being uploaded to our twitter and facebook page. So if you can’t join us on the day, please help us by sharing the photos as they get uploaded. 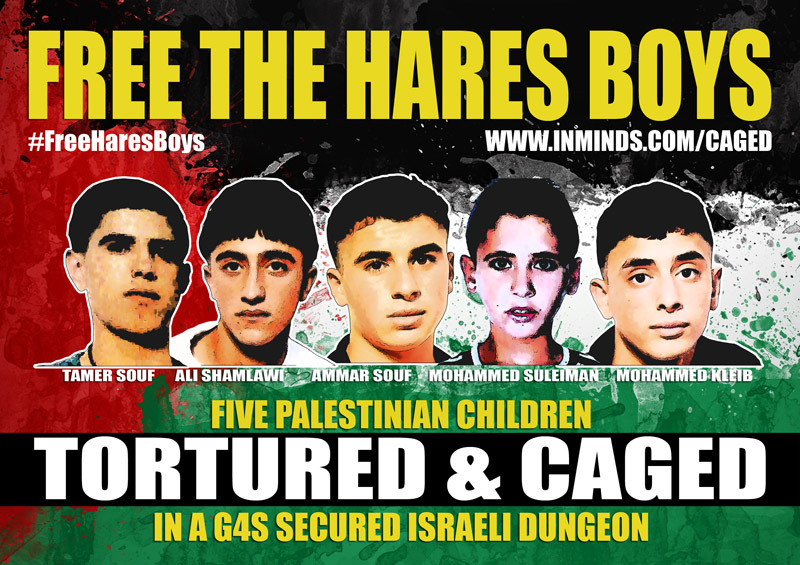 Please help raise money for the Hares Boys – five Palestinian children abducted from their homes in the village of Hares and caged in a hole in the ground and tortured until false confessions were extracted for stone throwing and are now facing possible life sentences. The aim is to raise as much as we can in 80 days (starting 30th Oct) to help all the 5 families to deal with the financial burden associated with having their children imprisoned. The children have already spent 8 months in an Israeli dungeon. Israel is the only country in the world that charges prisoners for their imprisonment. They have to buy food, soap, toothpaste, and everything else for highly inflated prices in the prison shop, because the Apartheid state does not provide for the people it incarcerates. Not only are such policies designed to break the spirit of the imprisoned and their families – they also intend to ruin them financially. Its costs over 125 euros per month to provide for one child’s basic needs in prison. The initial target of 2000 euros has been reached thanks to our French comrades, who raised a magnificent 1000 euros. The target was however kept low because of the way the fundraising works – if you don’t reach the target in 80 days all the money is returned and the families don’t get any of the money. So we still need people to contribute, every little helps. So far 2,822 euros have been raised with just 19 days remaining. Around 6% of the amount raised goes towards administrative and bank fees of namlebee – the hosts of the fundraising. Please give generously, thank you.